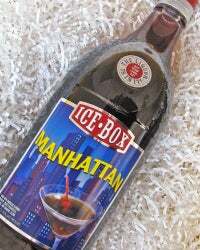 Am I having pre-made Manhattans made by a company named Ice Box whose slogan is "THE LIQUOR IS IN IT! JUST POUR OVER ICE?" Have I dispensed with the ice? Am I gonna be blotto by Jeopardy? GTERS! What methods have you found to quicken the happy dance.